A few months ago, I wrote about my search for all of the new money and transit service our beneficent leader, John Tory, had showered on Toronto’s transit riders. The answer, of course, is that the amount delivered is far from what was promised, and that’s before the pending cutbacks of the 2017 budget. We will add service during peak periods to 25 busy bus routes, to reduce crowding and improve travel time. This prompted some head scratching considering that recent service changes have all been about trimming service, not making major additions, and certainly not to 25 busy routes. After a few emails to and fro with the TTC, there was finally an admission that, oops, those new buses really don’t exist. Or, well, they did, briefly, but they don’t any more. In January & February 2016, the TTC increased peak bus service on 28 routes using 23 buses thereby achieving the 2016 charter commitment early. However, since then, an equivalent number of peak service reductions have been made to mitigate the impact of the TTC’s deteriorating and decreasing legacy streetcar fleet and to sustain service in the downtown. In November 2016, the TTC reduced service on 8 routes freeing up 9 buses to reallocate to the 511 Bathurst. And, in January 2017, the TTC reduced service on 13 routes freeing up 20 buses to reallocate to 501 Queen and other streetcar routes. There’s a bit of creative rewriting of history there, plausible though the explanation might be. First off, it was clear that when the 2016 charter was framed, the TTC knew that it had crowding problems, and planned to address them. Provision for this was in the fall 2016 service plan, but that was killed off when ridership failed to grow as expected through 2016. The improvements cited by Upfold, however, went into operation much earlier. Service reductions came on a different list of routes, with some overlaps to the one above. The net effect was a reallocation of service rather than an overall improvement, although it could be argued that routes losing service had capacity to spare under the Service Standards. The situation with delays in streetcar deliveries is a serious one that has been gradually building as the old fleet wears out. However, it is important to take a longer view of the evolution of bus service in Toronto to see how fleet usage has evolved over the years. The charts below, with data taken from the TTC Scheduled Service Summaries, show the total number of buses used during the two peak periods. The blue portion is for buses running on bus routes, and in recent years the green portion is the articulated bus count adjusted by 1.5 for the larger capacity of these vehicles. The top of the blue section represents the buses serving bus routes on an equivalent-to-standard-bus basis. The red sections at the top of each bar are for buses used on streetcar routes. 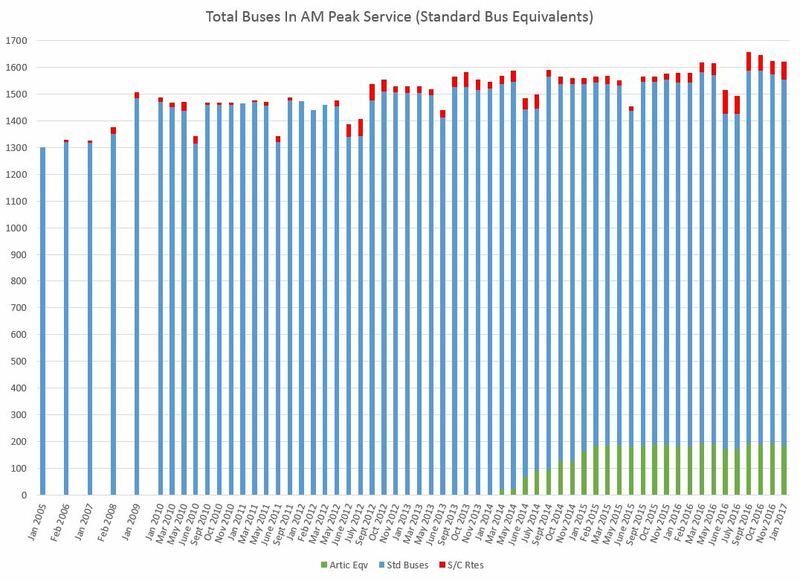 The AM peak service improved slightly in late 2015 thanks to new buses purchased that year, but the numbers have been falling back.The total AM peak has not been flat since mid-2016, but has been slowly falling. If this were only a case of trading off buses for streetcars, the total would be constant. This shows the effect of service trimming in late 2016. 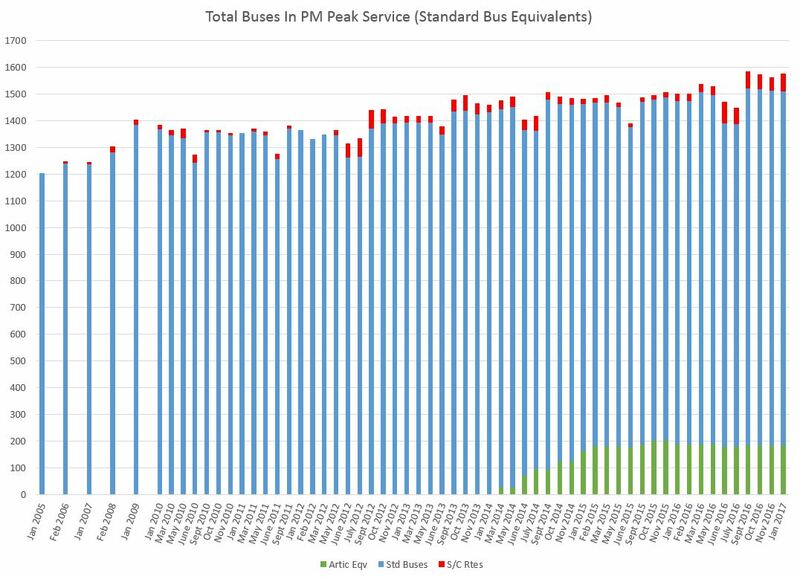 The situation in the PM peak is different because this period uses fewer vehicles (school and work peaks do not coincide in the PM), and so service is not constrained by the fleet as in the AM. Assuming that the 40 new Flexitys promised by Bombardier arrive during 2017, then in theory many of the buses could be freed up for service on their own network. However, the TTC might decide that retiring old streetcars is a more important goal and spread the return of full streetcar operation into 2018. Nothing is certain until we actually see Bombardier’s cars. Full streetcar service on 504 King (plus complete conversion of 514 Cherry to Flexity cars) will improve capacity on King Street, but much of this is unlikely until 2018 at best. Current plans for Flexity implementation are on 509 Harbourfront, 514 Cherry, 505 Dundas and 511 Bathurst. The irony in 2017 is that the streetcar shortage is actually saving the city money because the total number of vehicles that would otherwise be in service would be greater. Service cuts on bus routes for fleet availability would not have been needed, and the TTC would be scrambling to find operating dollars to run a full complement of streetcar service plus all of the buses it has available. Wouldn’t a new Flexity on Bathurst have been cheaper to operate than 2+ buses of medium age? All in all, not much good news. I drove along Lake Shore Blvd. in old Etobicoke today (Sunday) and there were 9 buses on this section. I don’t know how many were between or in Humber Loop and Dufferin. No wonder the patrons prefer the bus; there are twice as many and they don’t get short turned. There are a lot of buses assigned to the 501L shuttle. However, at any given time there will be two or three laying over on Lake Shore just east of Brown’s Line (I haven’t gone to Dufferin loop to see what happens there). They also often travel in pairs. The headways are ragged. Sometimes CIS is on the job, and the bus is told to hold for five or six minutes. Steve: It will be interesting to see the CIS data for January when I get it. Stay tuned! Another observation on the 501L. For those who wish that streetcars would be discontinued and replaced by buses so as to make driving easier, this is your chance to drive on Queen between Roncesvailles and Dufferin. I have had that experience and find that it is not easier to share the road with buses. In fact it is much more irritating than the streetcar alternative and because of bus capacity there are twice as many of them. CTV tonight had coverage of the new subway extension showing new Downsview station. Very impressive looking! Might be some hope for this city yet! Due to open end of this year. 91% complete. 2 years late! $500M over budget! Not a lot of hope for Scarborough! Mentions new stations will not have fare collectors account of Presto. Yet, what do we see in the news clip? A brand new collector’s booth! Andy Byford answered question about delays, cost overrun etc. etc. He very carefully did not say one of the big problems allegedly was repeat interference by politicians etc, demanding changes etc. Any truth? Steve: If you look closely, you will see that the booth is more open than the standard ones because it does not have to be secure against theft. What this will do for the heat/cold over seasons remains to be seen. The issue of political interference has come up in another context, the discussion of a report about project management that was recently at the TTC and then the City’s agenda. Both Andy Byford and City Manager Peter Wallace have stressed that projects will now be designed with specific “stage gates” to measure progress and require explicit approval to proceed. During the debate, Byford made the point that too often they are asked to simply “get on with” a project without a proper scope or plan. The point has been raised, but softly, softly so that the managers can point to explicit events where the pols couldn’t get their acts together. All that said, the professionals need to avoid proposing “half projects” that are cheap enough to get through the budget process, but not sufficient to actually achieve anything without add-ons. According to City News, passengers love the extra buses and the quicker service on Lake Shore Blvd. W., when they are doing construction on the streetcar tracks. That’s because the city is dragging their feet with putting in a streetcar right-of-way along Lake Shore Blvd. The streetcars have to share their tracks with the single-occupant motor vehicles making their priority left turns at Park Lawn, and other intersections. When will the city put in the needed right-of-way? What decade or century will that ever happen? Or would it upset the city’s motor vehicle gods? Steve: This is all part of the “Waterfront Reset” study now in progress. There is, as you probably know, a constraint in part of Mimico that the road right-of-way is not wide enough to accommodate reserved lanes for streetcars. The question then becomes how much of Lake Shore should be converted in this way. This is also bound up with issues such as Park Lawn Loop and the Legion Road extension. In February, I will have the January CIS data for route 501, and will be able to compare travel times by mode for this section of the line. The TTC has thrown buses at the 501L. Even with buses travelling in pairs, the headways aren’t so bad. Once the TTC decides it needs the buses elsewhere, things might change. Also, residents on The Queensway are getting worse service. I was on a shuttle bus that left behind maybe a dozen waiting passengers westbound at Roncesvalles. The difference in speed has — in my observation — nothing to do with ROW for the streetcars. The buses are being operated more briskly: possibly because the operators are not being watched, so if they hurry, they can get a tasty twenty-minute layover at the terminus. Combine fast operation with excessive running time (according to people who I trust to be accurate), and you are on break half your shift! Whereas the streetcars were scheduled more slowly, and in through operation days, operators could lollygag along Lake Shore while still making it to Neville Park in time (or getting short-turned). The other difference in speed, as I experience it, comes down to equipment. It seems to me that the extra weight and propulsion design of CLRVs and ALRVs really shows up poorly on Lake Shore, as it doesn’t on a crowded and slow street in the old city. PCCs could do a lot better. It feels to me that the new LFLRVs have quite snappy acceleration on Spadina; I wonder how they would do with pantographs for full current draw and a wide-open Lake Shore Boulevard ahead of them. With transsee you can see how far ahead or behind schedule each bus is. Below is what I see this afternoon. Going eastbound, Five buses 5-10 minutes ahead of schedule. (westbound had a 15 minute gap in service). I’ll see about added schedule information to the new Route Vehicle Locations page. I won’t be able to add schedule information to the Route Vehicles Locations page for the TTC at this time because the NextBus data for vehicle locations doesn’t include the trip information needed to know which schedule its on. I have another theory about why buses are being run on 511 instead. I think it could be more because of the construction delays at Exhibition loop and that they are running more of the new cars on 509. With them all turning back at fleet it gets to be a bit of a mess. Since they need shuttle buses into the Exhibition grounds anyway they can kill two birds with one stone and limit the streetcars in fleet loop to just one line well the other one provides shuttle buses and the streetcars from it can go elsewhere. The left turning light from Westbound Queensway to Soutbound Windermere needs to adjusted in afternoon rush hour to help get the 501 buses move along. Terrible light. The left-turn-only signals along The Queensway are now moot because there are no streetcars travelling to the left of the turning cars. On St. Clair, I noticed that the left turn only signals were covered over while streetcars were gone, allowing more time for turns. (This was at St. Clair and Old Weston; the 41 Keele buses turn there.) Mind you, The Queensway has faster traffic so maybe letting turns throughout the green phase might lead to some good accidents. This week (of January 30th) my wife has been asking not where the buses are along Royal York Rd. (served by the 76/76A-Royal York and 15-Evans routes) but where are the buses that a passenger can actually board north of Bishop Allen Academy (high school). She had a doctor’s appointment downtown yesterday at 1:00 p.m. and is normally fastidiously early for everything (a blessing in this particular case) and so went out to the bus stop across the street from our apartment building just after 11:00 a.m. to catch the bus up to the subway. She has been sick so can’t walk up to Royal York and Bloor and once she had left the apartment, I didn’t worry about her. Seems that 8 buses passed her by completely full and it was half an hour before she could actually get onto a bus to head north. Why? Mid-term exams at the high school and all the students who would normally be crowding the buses only up until 9:00 a.m. and then only around 2:45 p.m. were now coming and going based on the sitting times of their exams. Same thing this morning, although, now that she had told me about the packed sardine cans, I gave her a drive up to the subway station, after having watched 3 buses pass by the stop, chock full to the rafters. She was tearing a strip off the poor Customer Service Rep at the TTC, but I guess the question is moot: why were no additional buses added to this particular route, given the large increase in passengers forecast – and realized – during this particular week. (And there weren’t, based on the NextBus TTC application, showing the usual amount of buses during the mid-morning period). Plus, these mid-term exams take place every year around the same time, so it’s not like it’s a surprise after the first year it happens…. Are there that few buses available with all the replacements needed for (new) streetcar shortages and streetcar route construction? The cheapness of City Hall during Rob Ford’s reign and afterwards has now been realized at a personal level for us and no amount of complaining seems to get anything done for transit riders. Half-a-billion dollars for the Gardiner and all those drivers who vote? No problem. Can you imagine what $500K would do to help transit users – and, as a result, drivers in the city? Writing letters and phoning councillors seems to be a useless exercise; even large protests by TTCRiders and the like only get the matter in the public eye for one or two newscasts and then it’s gone. How do transit users say they’re mad as hell and they just won’t take it anymore?!? Steve: There is no shortage of buses during the midday period. I would hang the blame for this primarily on the school which should have alerted the TTC to their need for extras on the route, but also on the TTC who should be aware of surge conditions like this that are predictable in advance. One thing we have less of these days is “service relief” buses that are used as needed, and that’s a direct result of budget cuts. Today we find that sitting in the first car of a pulled GO train will provide you with almost as much diesel exhaust as if you followed one of the TTC’s surviving buses around town, relentlessly superinhaling the fumes. Whatever happened to Tier 4? Why doesn’t the study mention the type of diesel locomotives being used in each case? On the Richmond Hill line they may have all been Tier 4’s, which is quite depressing. Also, the little that was said re push trains implied that less pollution from the locomotives was entering the cars. At speed, my question would be: How can ANY diesel fumes enter the cars? Steve: In a push train, the fumes from the engine trail behind the train, while in a pull train, they can get sucked directly into the leading cars by their ventillation systems. Also, the worst situation is probably during acceleration away from a station when speed is less of a factor in dissipation of the exhaust. You can never find a Wightman when you really need one.